It is 2400 A.D. You are likely to be policed by a robot. A wacky single character RPG with no leveling, no experience points, simplistic combat, a ridiculous improve-by-use character development system, and – sounds like the worst of it all – an annoying time restriction you get (kind of) penalized for violating. Can such a game be fun? It probably can. But can it be, you know, a good RPG? Yup, surprisingly enough, it can that, too. Provided the game in question is developed by Origin Systems and called 2400 A.D.
Public announcements, used by the Tzorgs to brainwash the local populace, are an important part of 2400 A.D.'s lore and atmosphere. 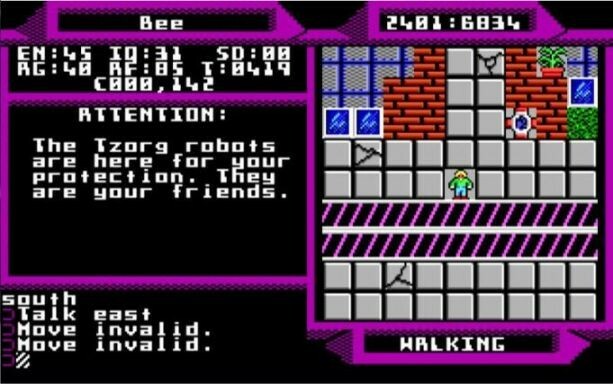 Being a futuristic RPG, and one of the first ones to boot, 2400 A.D. (1987) is expectedly mad about robots. The man behind it, Chuck "Chuckles" Bueche, an Origin co-founder alongside the more renowned Richard "Lord British" Garriott, is mostly remembered for another gem of his, Autoduel (1985), a role-playing/driving game hybrid also set in the future and centered on riding around in heavily-armored battle cars. 2400 A.D. is, to its credit, no less obsessed with gadgets and shooting things. The game takes place in Metropolis, the capital of Nova Athens, a small, recently colonized mining planet strategically located on the fringe of the explored and controlled galaxy space. Being a well-funded university city, specifically designed by the United Stellar Council to advance science and learning, and as an outpost to explore, watch over, and make contact with the rest of the galaxy, it is no wonder that Metropolis was attracting scholars from throughout the Council space and beyond. It all went well -- until it went awry. In 2277, a group of alien scientists joined the university to pursue an allegedly harmless robotics research project; based on the results of their research, the aliens founded Megatech Industries, undertook to automate the running of the city by introducing the subway and slidewalk systems, and even managed to secure a top-secret defense contract with the Council. There was a rub though. The aliens were called Tzorgs. What were the Council thinking, those fools? You can't find a more evil-sounding name for an alien race; and boy, their intentions were mean! Having gained enough knowledge and technological advantage, the Tzorgs attacked. Soon Nova Athens and the outlying planets were captured. Martial law was introduced in Metropolis; Public Tracking and Registration Offices were established to keep dossiers on the citizens; and -- oh, the horror -- the Metropolis Botanic Garden was turned into the city dump. I mean, what else could you expect from the victorious big baddies? Soon forced to leave the planet to take care of their evil raiding and pillaging business elsewhere, the artful Tzorgs installed the advanced Robot Patrol System to police Metropolis and keep things under control; and so the robot rule began. Unsurprisingly, many NPCs are annoyed at being policed by an army of robots. You are a computer specialist from off-world, having recently arrived in Metropolis from the mining settlements. Contacted by the underground, who see you as a potential recruit and indeed their last chance, you are the only one able to carry out the rebellious plan. Having the advantage of no prior police record, unknown as you are to the ever-vigilant robot police, you are free to roam the city of Metropolis, gathering clues and items with the underground's help. It is your mission to find the rumored secret tunnel into the Authority Complex, collect the information and amass the sheer fire power necessary to make it through, reach the main control console, input the deactivation codes you must first pick up elsewhere -- and finally end the police rule by shutting down the entire robot army. If you can accomplish that, Nova Athens will be free, the Council forces will gain access to it, and the citizens will walk the streets without fear. That no small task, which can in fact be performed via several alternative routes, constitutes the game's main quest. 2400 A.D.'s character creation is quite simplistic. Choose a name, allocate 99 points among the attributes -- and let the fun begin! 2400 A.D. is basically a single character "Ultima lite"; compared to Ultima, it is in many respects simplified and made more action-ey. 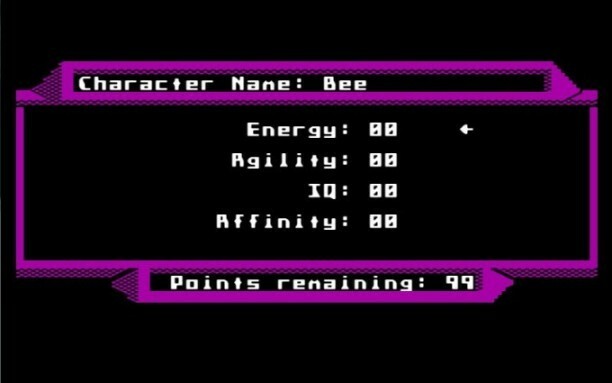 At the character generation, you must type in a name for your character as well as allocate 99 points among 4 attributes: Energy (EN), representing your physical prowess and stamina; Agility (AG), the measure of your dexterity and combat skill; IQ, standing in for your mental capacity and knowledge, including the ability to repair broken equipment; and Affinity (AF), which reflects your attractiveness to others and congeniality. All the attributes prove to be important gameplay-wise except, it seems, your IQ; at least I haven't been able to find any use for it apart from repairing things during my two playthroughs. The way you distribute the points has clear, and sometimes unpleasant, consequences, especially at the beginning of the game. If you invest too few points in Energy, prepare to frequently pass out, both in combat and when breaking open locked doors: as soon as your Energy -- combining the traditional HP and Strength attributes in one -- reaches zero, you collapse unconscious, waking up either in jail or, in an alternative scenario, first at the hospital and then, in case you don't have enough money to pay for the outrageously priced hospital treatment (which you indeed most probably won't have), behind bars again. Low Agility will make you miss too often in combat, also resulting in a quick defeat. Put too few points in Affinity -- and be straightaway ignored by NPCs! Which is a nice quirky detail, even if there is, alas, no specific low-affinity route through the game. Improving your attributes in-game is fun if wacky and a bit too easy: maxing them out is a matter of only a few hours of gameplay. 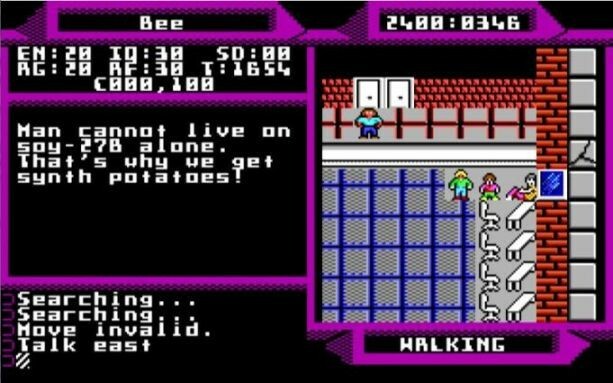 (With beating the game being a matter of only several hours more, depending on how quickly you'll be able to get through the numerous puzzles.) Your Affinity, and in some rare cases IQ as well, is improved by talking to NPCs and asking them the right questions based on the clues and keywords you previously found. Agility is gained with combat experience; the more robots you destroy, the more agile you grow. You mostly increase your IQ by fixing weapons and armor, which tend to fail quite often. In fact, as explained in the manual, some weapons get broken more easily than others, a simple fact that you can conveniently use to your own powergaming advantage. And given that the only way to increase your maximum Energy is to be constantly running around like crazy instead of walking -- well, a hero's gotta do what a hero's gotta do. There is, I must add, another, alternative and more advanced way to boost your IQ and Energy, a way that I won't be spoiling for you here as you are supposed to find it out for yourself. It is, however, not only extremely costly but also has some interesting consequences that are well-woven into the game's overall setting and mechanics, so be sure to try it out for yourself, preferably when you are not yet too powerful! You won't regret the experience. Even when they don't really know what they are talking about, NPCs can provide important exploration clues. In 2400 A.D., you only fight robots. The evil alien master race, the Tzorgs, do not themselves appear in the game at all. Combat itself can best be characterized as timed turn based, with Energy determining your HP, and Agility your chances to hit and to evade. With CPU cycles in DOSBox set to 2000, I only had about half a second to issue a command to either attack, move, or use an item before the enemy executed its next turn. That actually makes the combat appropriately quick and dynamic; appropriately, I must add, for a simple RPG of this kind. Weapons are varied enough, and there are no restrictions on what you can equip save for the decrease in to-hit chance if your Agility is too low for the weapon you've chosen. Armor comes in several types -- including the special main quest-related kind of armor that lets you bypass force fields -- and makes a lot of difference in combat. All the weapons as well as some armor and equipment consume energy and must be regularly charged either with energy cells you can buy (or find by following clues) or from energy nodes scattered around the city. Using the nodes is, however, illegal as they are there for the robots' needs, not yours, and will alert all the nearby robots into attacking you. You may sometimes want to set off an alarm, however, as disabling robots and searching them for their energy sources is the main way of making money in this game; the energy sources you collect are automatically exchanged into credits. And the sooner you disable a robot after it has recharged at a power node, the more energy it will have left and the more credits you will receive. The robots come in four classes, from the weakest ones patrolling the streets to the strongest and really deadly ones guarding the more sensitive areas. A Checker, for instance, checks you for Zone Authorization Cards, and a Police robot for weapons and other contraband; a Follower, once it notices anything suspicious, will annoyingly stick right next to you as you explore around, patiently waiting on you to do something illegal; a Hunter, being a stationary guard robot, will detect any movement and search for its source for a few seconds; a Mech robot is there for relaying alerts and carries no weapons. Mechs mean easy credits -- provided you can catch them, as they'll be doing their best to run away from you! And that's just five types of robots out of more than fifteen. There is some good robot variety in the first two classes, but not so much in the third and the fourth. Unfortunately, the developers seem to have run out ideas at some point, and the higher-class robots are simply reinforced versions of the lower-class ones. The robots are reactivated some time after being disabled, so it is always advised to clear an area in one go if you can handle it. Disabled robots can provide cover, as can weirdly courageous NPCs that keep stubbornly getting in the firing line. Nothing compares to having slaughtered a small army of class 4 robots and stripped them of credits! If you think the combat in 2400 A.D. is completely devoid of any tactics or thought, you are both right and wrong. You can, as I did in my first playthrough, just blast your way to the endgame, becoming a powerhouse killing machine. It is fun and, thanks to the game's relatively short length, never gets boring; after all, nothing brings more satisfaction than stripping the freshly recharged robot of credits. Another possible approach is to make use of the fact that robots themselves consume energy: having found an appropriate cover or moving around the battlefield in a clever manner, you can simply wait for some or even all of the enemies to run out of power. You won't of course get any credits from it, but that is still a viable tactics. The best and smartest way, however, is to creatively employ the game's numerous gadgets. Equipment being one of its high points, 2400 A.D. boasts a wide selection of devices that can help you deal with a combat or non-combat situation: time bombs and stun guns, scanners and jetpacks, passcards and holoprojectors, video scramblers and directive overrides. Like weapons and armor, most of the gadgets are only sold at the underground vendors and can be confiscated as contraband, which is unsurprising given the political situation in Metropolis. Relying on gadgets, you can actually avoid some of the fights that may at first seem forced. For the most part, you'll get to know a device's purpose from the manual or through collecting clues; in some of the more important cases, however, you can only find out its use in alternatively solving or bypassing a puzzle through experimenting -- clues, puzzles, and experimenting being without doubt the main attraction of the game. The exploration is done in real-time, and regularly checking in at the Public Tracking office is a necessity if you don't want to attract too much attention. 2400 A.D. is first and foremost an exploration and puzzle game. The exploration is done in real-time -- and the timer is ticking! As a newcomer to Metropolis, every 2000 ticks you must check in at the local Tracking Office, which resets the timer and lands you a social demerit (SD) if you are late. Receive five SDs, and you'll be put in jail. At first glance this kind of time restriction seems to be the game's most annoying feature, even if it certainly adds to the atmosphere. The good thing about it, however, is that, 2400 A.D. being an RPG, the timer is also implemented as a role-playing feature. You do get penalized for violating the time restriction, but you can still choose to ignore it -- and suffer the consequences, with robots attacking you on sight! Or not suffer, provided your character is strong enough to cope with them. The game is trolling you, and you can troll it in return. After all, even getting sent to prison is no big deal, for reasons that you're better off discovering for yourself. Under the Tzorg rule, even potatoes are synthetic. Once you get accustomed to the timer, you can start gradually exploring the entire city of Metropolis. The city is quite huge and sandbox-ey, featuring several underground and above-ground levels and divided into five large zones: the downtown, the administration complex, the university campus, the Megatech industrial zone, and the apartment district. Each zone except the downtown requires a corresponding Zone Access Card to roam it freely -- alternatively, you can choose to enter a zone illegally and, again, face the consequences if caught -- and each is populated by a large number of NPCs, plot-critical and not. The conversation system is keyword-based, and NPCs aren't exactly the wordy types, guarding their secrets carefully and frequently waiting for you to type in a specific keyword that you can only find elsewhere. (Even in my two playthroughs, I haven't been able to get all possible information out of NPCs, and I tend to explore everything very thoroughly.) NPCs are the only source of your in-game knowledge and talking to them is the sole way to advance the main quest. Accordingly, the narration in 2400 A.D. is bits and pieces, driven forward by clues, often insignificant by itself, that you should -- though not necessarily must -- collect. Sometimes a single clue, correctly understood, may get you through the puzzle; sometimes even three of them are not enough. Even strictly adhering to the main quest line is not always the best option! Which is only one of this game's many surprising aspects. You are highly unlikely to make it through this slidewalk maze without taking into account a certain seemingly unrelated clue you should have received earlier. Alternatively, you can brute force it if you are ingenious enough to find a way. In 2400 A.D., everything is a puzzle. Many of the more important quests can only be solved if lined up in a puzzle-like chain. The absence of a quest journal or an automap only make that aspect of the game stronger. The closest you get to having a map is by acquiring a certain device that lets you survey your surroundings when used; it has a very limited scope, though, and leaves much for you to figure out by yourself. Finding your way into the underground is certainly one of the puzzles, with several solutions hidden around the city. Sometimes failing is the best option, and you can learn as much, if not more, from your failures as from your successes; being arrested, for example, is actually the quickest way to reach the underground, requiring, however, a bit of out of the box thinking. Getting to know where to find an item, who to ask about it and who to show it to, all belong to the game's most pleasant and challenging moments. Even locating the vendors to buy new items from or sell old ones to (and those are two different types of vendors) can be a problem if you don't look around or follow clues carefully enough, as the underground tunnels tend to be quite maze-like and hide many secrets. There are also other puzzles: a slidewalk maze, a maze of pushable crates, or a transporter maze. Writing down clues is a must, as is searching around for them. The controls are again Ultima-like, with the game utilizing almost the entire keyboard for issuing commands. You can't just see the items lying on the ground next to you, you must search around to uncover them. 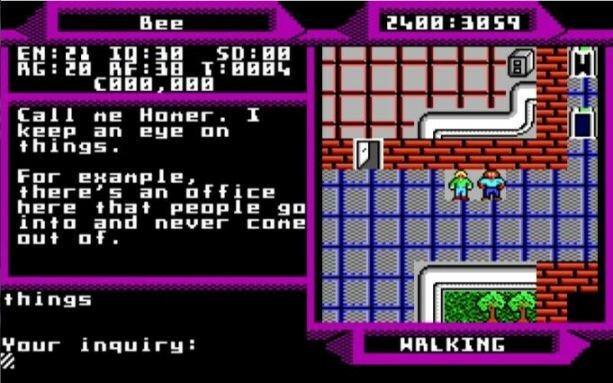 The game features some of Ultima V's future and much praised interactivity, which creates even more room for implementing puzzles. You can push around or climb over many of the furniture items surrounding you -- you can even climb over NPCs in your way! -- sometimes revealing well-hidden, and even plot-critical, passages. Climbing pipes to get to otherwise inaccessible areas is a must, too. Doors can be kicked out, consuming a good deal of your Energy, 20 or 40 points depending on the door type. And if you can find and repair (which is also done as a puzzle) the game's most powerful secret weapon, you'll be able to simply blow doors open like a real badass. The city of Metropolis features an extensive slidewalk system that can also provide some entertaining moments (try disabling a robot standing on a moving walkway! ), as well as transporter and subway networks. Figuring out how to operate transporters, including the secret ones, is in fact one of this game's hardest puzzles. And as far as interactivity goes, you can even get run over by a subway train! Truly ground-breaking stuff. Occasionally, a resistance member is captured by the robot police and placed on display outside the city’s Administration Building. There may not be much of a plot in this game, but it certainly has a lot of atmosphere. As you explore the city, you will frequently hear the public announcements used by the Tzorgs in their attempt to brainwash the not-so-susceptible local populace. Public lectures or the rationing of all meals, an increase in robot patrols due to recent disturbances (in which the protagonist certainly took no small part) or the "rehabilitation" of ten more rebellious citizens -- a lot of things can be announced, all adding to the feeling of a huge living city. Many NPCs go about on their business, either not willing to talk to you at all or only delivering one-liners such as "I despise robots! ", "Things were so much nicer before the Tzorgs came" or "The lectures are just another way to brainwash us"; some of NPCs support the underground resistance movement, some do not, speaking their mind as you chat them up. Occasionally, a rebel will be captured by the robot police and placed on display outside the city’s Administration Building. It may be Tim, or Leroy, or any other NPC you've previously met, and they will be inaccessible in their normal role during the detention period. Nice! 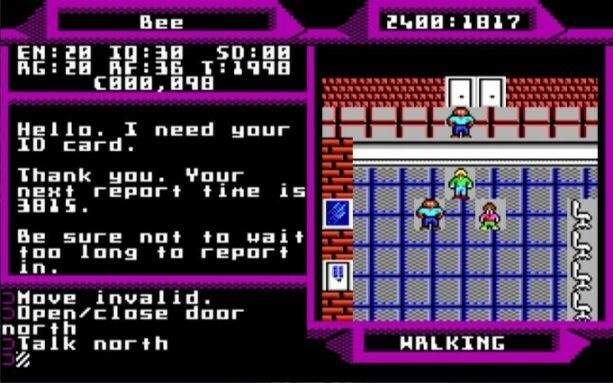 Overall, 2400 A.D. is a fine little RPG from times long past. The simplistic combat and character development systems are a bit of a letdown, but the exploration, puzzles, and atmosphere more than make up for that. Playing through the game is a fun and surprisingly varied ride; too bad that even a game like this would probably be too complex and frustrating for today's casual gamer. Which is why, alas, we cannot have nice things any more. P.S. Special thanks are due to those who followed my 2400 A.D. LP and offered valuable comments on the game! There are 27 comments on Forgotten Gems: 2400 A.D.